To make the flying boat we needed something strong enough to hold performers while rolling on the track and light enough to be pulled in the air asymmetrically. 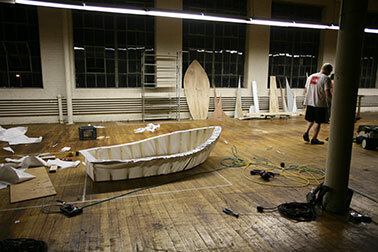 After looking at a number of real boats, we decided it would be best to make one from scratch. Our boat has a wood skeleton and we’re heat shrinking a plastic skin for it. Next step: painting it.